The number of injured has exceeded that of the 2014 war. MSF is working relentlessly in the face of enormous needs. Most of the injured will have consequences that will last a lifetime. Concern is growing over a planned protest for 5 June. For the Red Cross, Gaza’s health system has been overwhelmed and cannot handle the high number of patients. Gaza (AsiaNews) – The number of wounded caused by clashes between Palestinians and Israeli troops in Gaza over the past few weeks has topped that of the 2014 war. According to Doctors Without Borders (MSF), since 14 May, when the number of casualties reached a peak, medical teams have been constantly busy with new victims of violence. The medical NGO has been working non-stop to cope with huge needs, noting that most patients will experience the effects of their injuries for the rest of their life. More than a hundred Palestinians have been killed by Israeli soldiers during protests on the border. Some 15 of them are children. To these must be added more than 13,000 injured, of which at least 1,000 are minors. To face the emergency, the international NGO has had to open a new clinic and another will start working in the coming weeks. Now all eyes are on 5 June, when a new day of protests and demonstrations is expected in the Gaza Strip. In recent days, the two sides have exchanged heavy fire. Rocket fire from Hamas and Islamic Jihad has been met by Israeli air strikes, which have hit scores of military targets connected to Palestinian extremist movements. 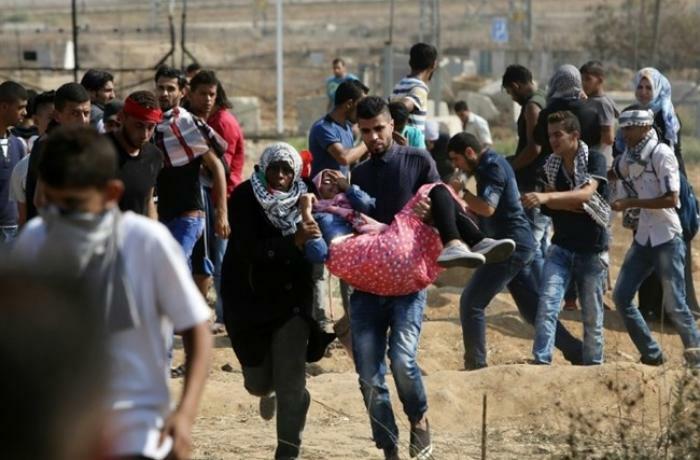 The violence follows deadly protests and clashes that broke out along the Gaza border on the occasion of the 70th anniversary of the Nakba. To stem the escalation the two sides have agreed to a kind of ceasefire, which came into force on 30 May. The fragile truce seems to be holding, so much so that the rocket attacks by Palestinian armed groups against southern Israel have ended, which, in turn, has stopped Israeli air strikes in the Strip. Still, the humanitarian emergency remains. MSF has pointed out that the current flow of patients is unlike that of 2014. In 90% of cases the wounds, often very serious, are in the lower limbs. In recent weeks, MSF teams have performed 315 surgeries, including 30 amputations, and have fixed 534 fractures. At least 900 people are in need of care and assistance. To face the emergency, the Red Cross (ICRC) has also decided to boost its presence on the territory. "The recent demonstrations and violence that took place along the Gaza border... have triggered a health crisis of unprecedented magnitude in this part of the world," said Robert Mardini, the ICRC's head of operations for the Middle East. The local healthcare system, he added, is "stressed and overburdened" and it "simply can't handle" the high number of patients.